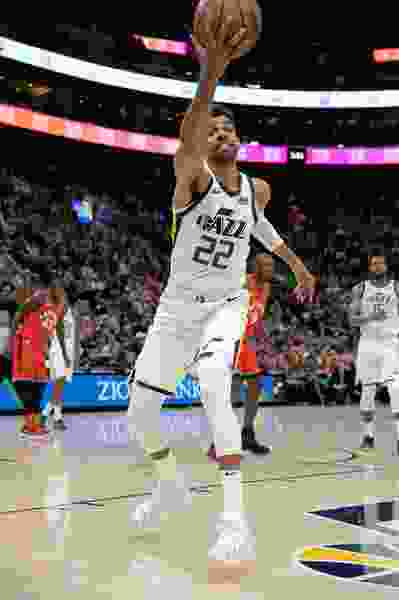 (Francisco Kjolseth | The Salt Lake Tribune) Utah Jazz forward Thabo Sefolosha (22) reaches out for a long ball against the Raptors in the first half of the preseason NBA game at Vivint Smart Home Arena Tuesday, Oct. 2, 2018, in Salt Lake City. Denver • The calm, composed tone of Thabo Sefolosha’s voice might have obscured the underlying anger if you weren’t paying attention to his actual words before Saturday’s game against the Nuggets. He’s a tad bit miffed. One, that he hadn’t played yet, and two, that the time he will eventually get may see him hindered on the court in ways that are beyond his control. After a five-game suspension to start the season for violating the league’s anti-drug policy, Sefolosha appeared in the box score only as a “Did Not Play — Coach’s Decision” for the next three, before getting three first-half minutes Saturday (and badly bricking two wide-open corner 3s). The plan was to split him between the three and four positions, but with minutes going to Joe Ingles, Derrick Favors, Jae Crowder, Royce O’Neale, and even a surprisingly productive Georges Niang, there simply haven’t been enough left for Sefolosha. He’s trying to take his lack of playing time in stride, but as a 13th-year NBA player who’s averaged 23.2 minutes per game for his career, he concedes it’s difficult to be glued to the bench night after night. He said he’s made it a point not to ask coach Quin Snyder about his potential role in the rotation, because he doesn’t want to be a problem player. Besides, he said, Snyder brought it up to him, so he’ll continue to stay ready. Of course, once Sefolosha does get more time on the court, it’s going to be a big adjustment — generally getting re-acclimated to game speed, and specifically because of the league’s emphasis on “freedom of movement” rules. Against Memphis on Friday, Utah was whistled for 29 fouls, leading to 24 Memphis free throws. While Snyder attributed much of that to the team’s own defensive breakdowns, Sefolosha said the way the game is being officiated now puts defenders in an almost impossible position.